2 Bedroom Semi Detached House For Sale in Sheffield for Offers in the region of £135,000. 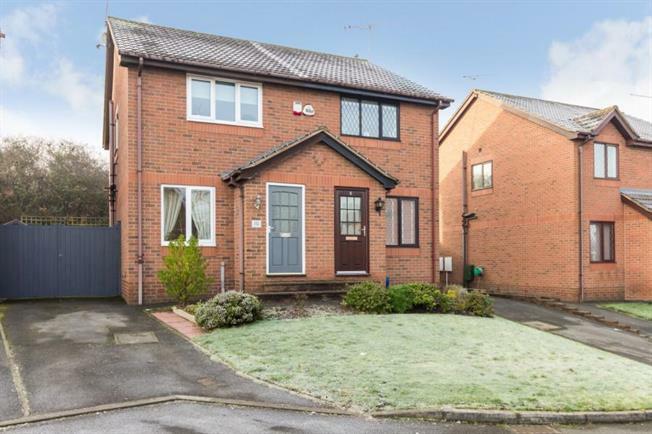 Occupying a quiet cul-de-sac position in the popular suburb of Killamarsh is this superbly presented and recently refurbished two bedroom semi detached home. Benefitting from accommodation across both floors, the property is likely to be of interest to first time buyers/young professionals, perfect to move straight in. An attractive modern breakfast kitchen leads into a well proportioned front facing lounge having an attractive feature fire surround with two double bedrooms, and recently replaced contemporary bathroom and externally a side double length driveway with double gates lead to a private landscaped garden to the rear, completing this desirable home. Well placed for local shops/amenities and a short distance to Crystal Peaks/Drakehouse outlets & Rother Valley Country Park. The accommodation in brief comprises: entrance porch, lounge with stairs rising to first floor landing and under stairs storage cupboard. A door leads into the fitted kitchen having an attractive range of wall and base units, breakfast bar area and integrated appliances to include electric hob, extractor fan, electric double oven. Space and plumbing for automatic washing machine and fridge/freezer. A rear facing entrance door accesses the rear garden. First floor landing: Master bedroom having a pleasant outlook and built in wardrobes, bedroom two and bathroom having an attractive three piece suite in white comprising wash hand basin and low flush wc in combination unit, bath with mains shower having drench head and screen above. Tiling to splash back and laminate tiled floor. Externally: To the front of the property is a lawned garden area, side double length driveway and rear enclosed landscaped fenced garden with garden shed and outside water tap. Location: Situated in the popular area of Killamarsh ideally placed for a host of superb local shops, schools and amenities, the village boasts a leisure centre and further cricket club with Rother Valley Country Park on the doorstep offering a host of leisure facilities and fishing ponds. Nearby Crystal Peaks Shopping Centre, Sheffield Supertram and superb local walks on the Pennine Trail are also part of the popularity of the area. Ideally placed for M1 motorway networks and links to Sheffield City Centre.